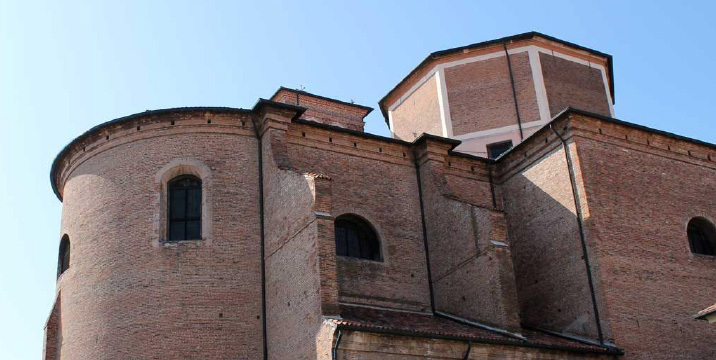 A relatively wide space that can be seen, in a scenic view of Rovigo of 1670, even more limited because the baptistery stood in front of the cathedral, a small structure which has been known since the thirteenth century, although its origin is believed to be older. With the rebuilding of the Cathedral, at the end of 1600s, it was necessary to expand the space in front and, in 1737, the baptistery was demolished. On the western side of the square stands Palazzo Manfredini, the period of construction remains uncertain between the XVI and XVIII centuries. 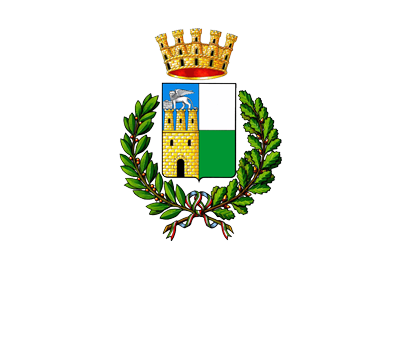 After World War II the square underwent further transformations, among them, was the construction of the nearby high school-gymnasium whose façade is a work in mosaic by the artist Virgilio Milani from Rovigo. In this area, the ancient district of Santo Stefano, between the Church and the Castle, the city of Rovigo was founded and flourished. The Cathedral, dedicated to St. Stefano, Pope and Martyr, probably dates back to the VIII – IX century, an era in which the ancient settlement developed. The information regarding the foundation of the church is fragmentary and incomplete, while the stories of the building are well-documented dating back prior to 1696, when the construction began. 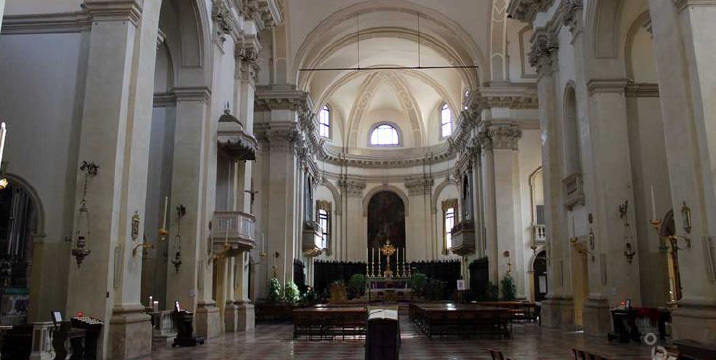 The design, undertaken by Girolamo Frigimelica of Padua, was for a church twice the size of the previous structure. The work, partially completed in the 1700s by Vincenzo Bellettato, left the facade unfinished in the form of a simple brick wall. 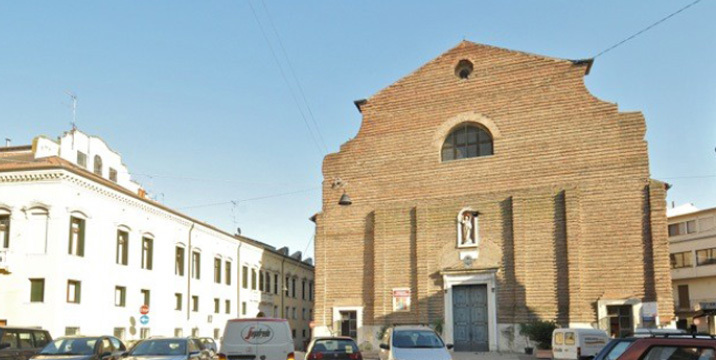 In front of the Church, once a much larger space, stood the Baptistery, called “Dometto”, later demolished. The church is divided internally into three naves, the current decoration dates back to the last reconstruction and does not correspond to any general plan. Furnishing the Cathedral was interrupted on several occasions, in 1750 and in 1764 for the renovation of the crossing floor and the tribune and, at the end of the 1700s, due to the collapse of the dome. The first chapel to the right, dedicated to Beata Vergine delle Grazie, Our Lady of Grace, is a round bezel (frame) which contains the fresco that once decorated the entrance portal of the Baptistery; the fresco was considered miraculous after the mason’s arm, who was to demolish it, was paralyzed. The first chapel on the left preserves a bronze candelabrum attributed to Desiderio da Firenze. The works preserved in the altars of the side crossings are of high quality, on the right, the altarpiece depicting the “Madonna handing the scapular to St. Simon Stock” by Andrea Michiel known as Michiel Vicentino on the left the “Risen Christ with San Bellino and Saint Stefano”, dated 1625, painted by Jacopo Palma il Giovane. The main altar is the work of Pietro Puttini of Verona, while the large canvas at the centre of the apse is attributed to Tommaso Sciacca and depicts “St. Stefano baptizing Lucilla and giving her sight”. The eighteenth-century walnut choir is remarkable.